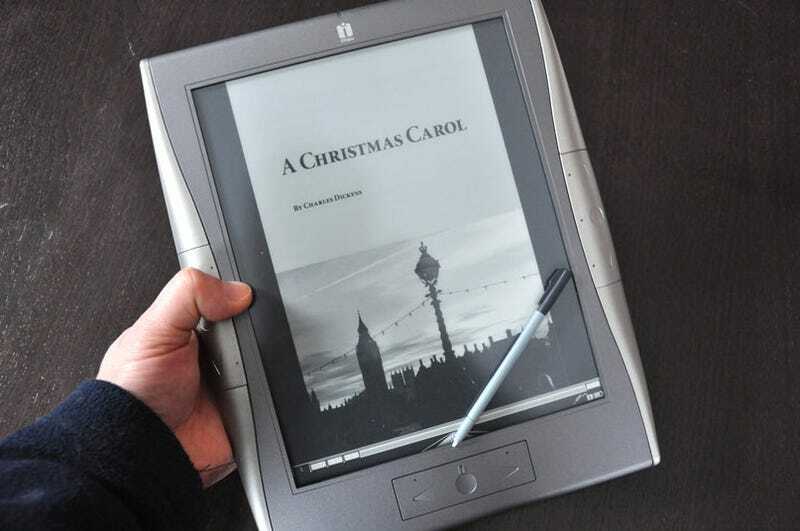 The Gadget: iRex's ebook reader, a huge 10.2" E-Ink display with Wacom touch surface—in short, the ebook reader that the Amazon Kindle and Sony Reader wish they were. The Verdict: If the Kindle was the Sidekick of ebook readers, the iRex 1000S would be the G1. Its functionality is broad, but it lacks the stability, comfort and focus of Amazon's perennially sold-out little snow speeder. As a technology statement, the iRex is impressive: It's the first ebook reader I've played with that has a 10-inch E-Ink screen. I'd seen the displays at tradeshows, but having one in my hand is different. It's nice to have all of that real estate without a lot of weight and no backlight or glare. (I'm assuming the E-Ink upgrade is the main cause for the 1000S's Hugh Jass price tag.) This is also the first ebook reader I know of with a Wacom touchscreen and an accompanying, almost Windows-like interface of pop-up menus and floating dialog boxes, plus the more typical launcher-style icons. This UI reveals the reader's computer roots, which is exciting but also frustrating. In the US, the debate between the Kindle and the Sony Reader is one of closed platform versus open one. (Ironic that Sony is the "open" platform here.) The Sony does have a DRM-heavy ebook retail operation, but it also plays, among other things, the many free PDF-format ebooks that are widely available on the internet. iRex doesn't really help you buy books, but rather it equips you with a versatile array of options for easing "large documents" into its memory. For one, you can "print" to the 1000S. It sounds high tech, but it basically involves converting the document you're looking at in Windows to a special format that gets saved on the 1GB SD card the 1000S calls its home drive. Another means to get content is PressReader, a third-party Windows app that securely transmits "800 newspaper titles from 81 countries, including The Telegraph, Washington Post, USA Today, Die Welt, NRC Handelsblad, Le Figaro..."
The 1000S currently supports Adobe PDF, TXT, HTML as well as the DRM'd Mobipocket PRC, but I couldn't figure out quite how to introduce the PRCs I did have to the system. I'm not saying it's impossible, I'm just saying the process isn't as easy as 1, 2, 3. Along those lines, there's a folder marked "Audible," and another marked "music," but it wouldn't take my Audible recordings or MP3s and besides, without a speaker or headphone jack, I'm not quite sure what they'd do with them anyway. A perfect example of how this advanced device makes no sense for Grandma (or even Mom, Dad, Big Sis, Big Bro, your kids, or any but the most nerd-tastic of your friends and neighbors) is the dictionary look-up function. I can set the stylus to instantly look up words that I tap, but when I do, the 1000S can't find any dictionaries. The nice thing is, you can add as many dictionaries as you want to the thing, but I don't happen to know where digital dictionaries come from. Maybe I'm dumb, but technology is supposed to help me with that, not make it all the more painfully obvious. I wanted to like the iRex. Its nine capacitive buttons are a fun departure from the typical interfaces of the day, though I found myself using the stylus most of the time to get around. That scared me, because, as a Wacom touch surface—which you can even draw on—the screen itself doesn't react to your finger. Lose that stylus, and you lose the easiest way to work the thing. Though I am someone who thinks that a gadget like this is only as good as the lush garden of content surrounding it, I can see how people who are into shadier sourcing of ebooks would find the 1000S a way cooler alternative to Sony's Reader. But for those people, I just hope that iRex works to make the firmware less buggy. In the few days I've been using it, I've had numerous freezes and crashes, and several full-battery false alarms—I thought the thing was fully charged only to find out, a half hour later, it was running on fumes.